Welcome to Milton Hyundai, your Signature Certified Hyundai dealership in Milton, Ontario. We are presenting the new 2018 Hyundai Sonata & Sonata Hybrid. You can find all the relevant information below. Enjoy! The 2018 Sonata was designed to give you a sense of discovery, excitement and confidence from the moment you get behind the wheel. The expressive exterior embodies our signature Fluidic Sculpture 2.0 design philosophy for a level of refinement and beauty that captivates attention. Engineered using our Advanced High Strength Steel, the highly rigid chassis and finely tuned suspension of the Sonata deliver exceptional handling and ride comfort. Finally, the intuitive and driver-oriented cabin is equipped with a broad array of available advanced safety technologies that allow you to embrace your journey with peace of mind. Status quo is nothing more than a starting point for our research and development. We are driven to push the envelope on innovation, engineering and design to deliver an experience that creates a new world of possibilities. It starts with the state-of-the-art lithium polymer battery. Stored neatly beneath the trunk floor, this lightweight battery pack powers a fully parallel hybrid drive system, providing seamless performance and exceptional fuel efficiency. Beneath the sleek, aerodynamic body lies a vast array of advanced safety features and premium amenities. The 2018 Sonata Hybrid and Plug-in Hybrid are an example of our drive to do better. We didn’t just set out to build electrified versions of our intermediate sedan; we set out to raise the bar for the segment. The strong and sophisticated design of the 2018 Sonata features advanced lighting technology and modern lines. A commanding hexagonal front grille is the focus up front, framed by swept-back headlights and standard LED daytime running lights. From the side, a bold character line spans the length of the vehicle and connects with the available LED tail lights at the rear. More aggressive design elements can be found on the Sonata 2.0T Sport Ultimate model. Standard 18” aluminum alloy wheels and quad exhaust outlets integrated into a unique rear diffuser deliver a striking, athletic stance. The aerodynamic design is not only striking, but also delivers a best-in-class♦ 0.24 coefficient of drag for exceptional fuel efficiency. Blending form and function in perfect harmony, every line and detail serves a purpose. The signature hexagonal front grille is enhanced with active air flaps that close at higher speeds so that the Sonata Hybrid and Plug-in Hybrid cut through the air with less resistance. The sleek front and rear bumpers further contribute to reduced drag, while available Bi-Xenon HID headlights and standard LED tail lights provide a stylish and energy-efficient lighting system. The available Bi-Xenon High Intensity Discharge (HID) headlights feature an Adaptive Cornering System that can steer the bright white beam to illuminate the road even as it twists and turns. This available feature makes loading and unloading your 2018 Sonata more convenient. The hands-free smart trunk unlocks automatically when it senses that the proximity key is within three feet of the vehicle, for more than three seconds. The stylish, available LED tail lights create a unique light signature design that sets the Sonata apart, even in the dark. Enjoy the sun, the moon and the stars through the available panoramic sunroof that spans above both front and rear passengers. Standard 16” aluminum alloy wheels complement the sophisticated styling of the 2018 Sonata. If your heart desires, go bigger with available 17” or 18” aluminum alloy wheels. More aggressive design elements can be found on the Sonata 2.0T Sport Ultimate model. A unique grille design, standard 18" aluminum alloy wheels and quad exhaust outlets deliver an athletic stance from all angles. By applying the results of thorough research into ergonomics, our engineers and designers can deliver a driver-oriented cabin intuitively laid out for comfort and convenience. Consider the T-shaped centre-stack layout with the available navigation display screen that is optimally positioned to help you keep your eyes on the road, or the steering wheel-mounted controls that are grouped by function for simpler interaction. Engineered to exceed your expectations, the 2018 Sonata Hybrid offers 380 litres of trunk space for unmatched cargo versatility compared to competing hybrid vehicles♦. Thanks to its innovative design, the Sonata Hybrid’s lithium-ion polymer battery is placed beneath the cargo floor, in turn permitting expanded cargo-carrying capacity through the available 60/40 split-fold rear seats. This means you can travel with hybrid efficiency without compromising on what you can bring along for the ride. Speaking of no compromises, the Sonata Hybrid and Plug-in Hybrid also feature an array of premium comfort and convenience amenities, including an available hands-free Smart Trunk. It opens automatically when it senses the proximity key behind the vehicle, providing you with an easier way to unload a handful. A standard 5.0” colour touch-screen display lets you stream music from your smartphone, talk to family and friends with the Bluetooth® hands-free phone system and tackle tight parking spaces through the rearview camera. Help avoid wrong turns with high-resolution maps and easy-to-follow directions thanks to an available touch-screen navigation system with rearview camera. The available Infinity® 400-watt premium audio system with 9-speakers and external amplifier adds more power and presence to your favourite music. Switch between two driver profiles at the touch of a button with the available Integrated Memory System. It automatically resets the driver’s preferred seating position and corresponding side mirror positions. Available rear side window sun shades provide rear passengers with relief from the sun's glare and increased cabin privacy. The Sonata features an available heated steering wheel for added warmth and comfort. Wrapped in leather and perfectly shaped for long-distance driving comfort. The agressive style differences of the 2.0T Sport Ultimate model also extend into the cabin.The front seats feature sporty bolsters, the D-cut heated steering wheel includes mounted paddle shifters and the unique instrument cluster offers crisp graphics.For added visual flair, a colour package with orange contrast piping and stitching is available with select exterior colours. Stay warm during Canada’s colder months with standard heated front seats. When the weather heats up, available ventilated front seats will keep you cool. Plus, find eight ways to further perfect your comfort with the available 8-way power-adjustable driver’s seat with power lumbar support. Your rear seat passengers will thank you for the luxury of available heated rear seats and the available rear air vents with climate control. Adding to the smart ergonomic layout of the driver-oriented cabin is an array of comfort features, such as standard heated front seats, an available 8-way power-adjustable driver seat with lumbar support and available ventilated front seats. To make shared driving more convenient, the 2018 Sonata Hybrid and Plug-in Hybrid also feature an available integrated memory seat and mirror system that allows you to switch between two settings at the touch of a button. The 2018 Sonata was fine-tuned and put to the ultimate test on Germany’s demanding Nürburgring racing circuit. This punishing process allowed us to craft a vehicle that strikes an ideal balance between handling performance and ride comfort. Under the hood, the standard 2.4L Gasoline Direct Injection (GDI) 4-cylinder engine delivers 185 horsepower. Drivers seeking greater thrust can opt for an available twin-scroll turbocharged 2.0L GDI engine producing 245 horsepower and 260 lb-ft of torque. Both engines offer impressive responsiveness and efficiency thanks to the standard 6-speed automatic transmission with SHIFTRONIC® manual mode. Constructed using Advanced High Strength Steel forged in our own steel mill for exceptional stiffness and rigidity, the 2018 Sonata delivers enhanced driving dynamics and occupant protection. The safety of the ultra rigid frame is coupled with standard equipment such as seven airbags1, including a driver's knee airbag for added protection, and a rearview camera for added ease while reversing. There are also an array of available driver assistance and situational awareness technologies that will provide visual and audible cues as required along your journey to inform you of potential driving dangers. 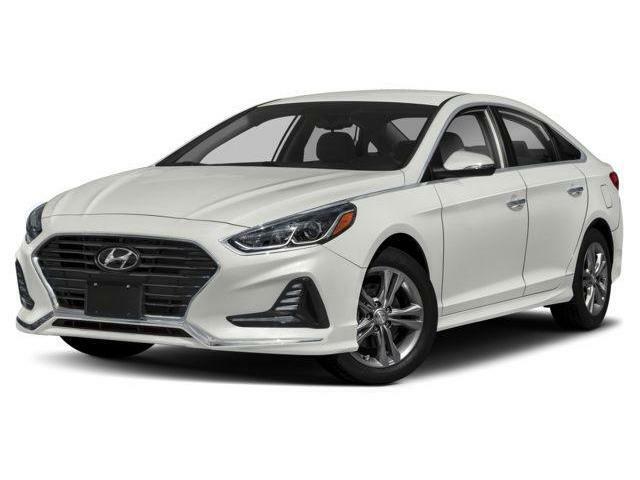 By offering a full-parallel hybrid drive system, the 2018 Sonata Hybrid can run on a gasoline internal combustion engine, an electric motor, or both, creating the perfect blend of power and efficiency. Powered by a 2.0L engine with class-exclusive Gasoline Direct Injection technology♦ and a 38kW electric motor, the Sonata Hybrid delivers a net output of 193 horsepower – with a total estimated range of over 1,100 km on a single tank of gas^. With a larger battery that can be plugged in and charged in under 3 hours◊, the 2018 Sonata Plug-in Hybrid is capable of travelling up to 43 km on electric power alone. Once the electric-only range is depleted, the Sonata Plug-in Hybrid reverts to operate like the traditional Sonata Hybrid, on a full-parallel hybrid drive system. What does this mean to you and your commute? To work: The advanced technology allows you to enjoy gas-free commuting during the week. By travelling up to 43 km on electric power, you can easily charge the battery at home overnight or at work during the day using a standard household 120V outlet. The Sonata Plug-in Hybrid can be charged in under 3 hours◊. The Sonata Plug-in Hybrid gives you the flexibility to travel as far as you want without being worried about a plug-in station. With the full-parallel hybrid drive system, once the electric range is expended, the Sonata Plug-in Hybrid begins to run on a gasoline internal combustion engine, an electric motor, or both, creating the perfect blend of power and efficiency. The Sonata Plug-in Hybrid also offers superior versatility for its class, with unmatched trunk space among competing plug-in vehicles. This is all possible thanks to the highly-advanced lithium polymer battery technology allowing efficient packaging of the battery (Sonata Hybrid trunk shown). The Sonata Plug-in Hybrid provides you with some additional information to keep you informed. This includes the battery charge status and an estimated electric range. It will also map out charge stations in the vicinity of your electric range so that if you prefer to charge up over switching to the gasoline engine (once the battery is depleted), you can. $26,874 x 84 Months @ 3.97% APR (estimated financing rate, cost of borrowing $3,927). $36,974 x 84 Months @ 3.97% APR (estimated financing rate, cost of borrowing $5,403). $36,827 x 84 Months @ 3.97% APR (estimated financing rate, cost of borrowing $5,382).